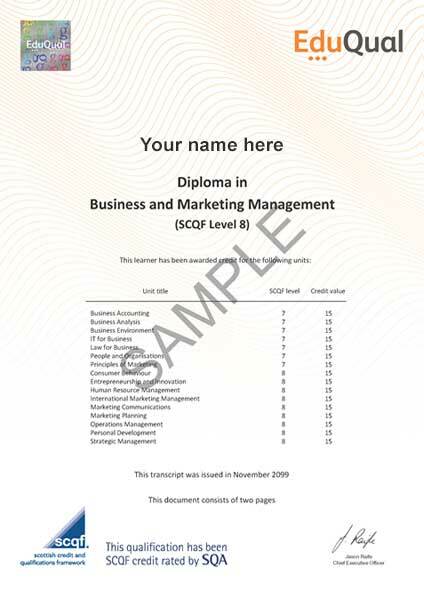 The Diploma in Business and Marketing Management (SCQF Level 8) is a 240 credit size qualification with 16 compulsory units and is a Regulated Qualifications Framework (RQF) equivalent Level 5 qualification.The Diploma in Business and Marketing Management (SCQF Level 8) is a 240 credit size qualification with 16 compulsory units and is a Regulated Qualifications Framework (RQF) equivalent Level 5 qualification. The Diploma in Business and Marketing Management offers learners the knowledge and skills needed to develop an understanding of the models, tools and techniques used in the fields of Business and Marketing Management. Moreover, it is designed to give students a comprehensive understanding of the key skills and practices that marketing executives and their organisations use to make informed marketing decisions that are vital to the success of their business. ● Evaluate a variety of creative approaches to product and service design, creativity and innovation that may contribute to organisational wealth.The Diploma in Business and Marketing Management offers learners the knowledge and skills needed to develop an understanding of the models, tools and techniques used in the fields of Business and Marketing Management. Moreover, it is designed to give students a comprehensive understanding of the key skills and practices that marketing executives and their organisations use to make informed marketing decisions that are vital to the success of their business. ● Evaluate a variety of creative approaches to product and service design, creativity and innovation that may contribute to organisational wealth.